What I did kind of lost trust in, are hard disks, especially high capacity notebook size drives. I am currently reviewing my backup procedures across all systems. I have created bootable clone of my daughter’s Macbook hard drive – just in case and start serious think about buying Drobo later this year. But on operating system side, I am happily staying with Apple and Macs. It is not perfect solution and is certainly not as rock solid and secure as Apple would like the world to believe – the last year record of security flaws, crowned with latest discovery of first trojan and root access hole in ARD proves it more than enough. But it is still – IMHO – closest thing to that ideal I have seen. To qualify that (before I get email from all my friends that happen to be Linux/BSD/Solaris fanatics enthusiasts: I agree that there are better, faster, safer versions of Unix available – OpenBSD, some Linux distros, etc etc. But using Mac is actually fun and pleasant experience, despite of all shortcomings and you can do with it much more than develop in Java or recompile C programs :-). For example run Photoshop or Textmate – none of which works under Linux. Therefore – Shane – do not hesitate to get a Mac. If my disk crash story made you reconsider, I am really sorry about that. Coffee sometimes ? Email me. The copying of external disk went error free and took almost 5 hours (210 GB). Fortunately, the MBP was usable – I did not want to modify too many files, but it was perfect for Web research and writing in Google Docs. After reboot, the TimeMachine decided that 85 GB needs to be backed up again. This seems like bug in TimeMachine, because I have not really changed much more than few gigs – 4-5 max during the few days. In some moment of bliss I have asked my son to get and build for me 250 GB external FireWire disk with this beautiful enclosure and on Sunday evening, I tried for the first time wonderful program Carbon Copy Cloner that duplicated the harddrive to external one, promising bootability. On Monday morning, at customer location I tried to copy VMWare image from network. System froze with beachball and had to be powered off. Same result for the second and third attempt … with only difference that it did not boot back and hard disk started to make that weird clicking sound. I brought it to Apple service center which confirmed the problem, took out the disk, ordered replacement part and asked me to come back tomorrow. That would cause a problem, as I am attending few meetings in Montreal in next 2 days and need my notebook with me and in working condition. Fortunately, the bootable external drive trick worked perfectly. After power on, I need to hold Option key and select the external disk – and everything works just fine. I am actually typing this on my Macbook Pro :-). No observable difference in speed, the only annoyance is that I cannot really use notebook in train or anywhere where there is no power supply for the drive. I am still amazed how flexible is the Mac hardware and how capable is the firmware. Being many years Windows user, before this, an idea of cloning disks and booting notebook from external hard disk seemed pretty far fetched. As they say in Germany – man lernt nie aus …. OS-X does not freeze too often, but it can happen and as a matter of fact, I have seen it happen before during my almost two years with Mac, so I did not panic. As expected, the Alt-Option trick did not work, so all I could do was to force power off. At first I was pretty sure that the hard disk is gone. But after booting up from install DVD (hold C during boot) and running Disk Utilities “verify” and “repair” disk, it did not find anything wrong with it. It was – according to Disk Utility – perfectly good, healthy disk, which only boot stubbornly returned to the No-Entry sign with each and every boot attempt. 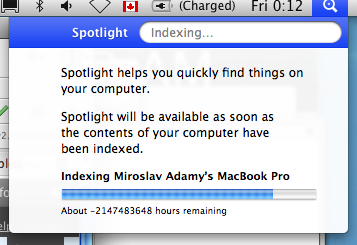 It was obvious that I will soon have an opportunity to really test out the Time Machine restore capabilities. Normally, I plug in the Time Machine backup disk every day after unpacking the notebook at home in my home office – and the magic of Leopard takes care of the rest. As Murphy wanted it, I had been working around the house and in the garden in last few days’ evenings, rather than in my home office where the backup disk is. So it happened that last time I had plugged the disk in was around Saturday night and all changes afterwards were not backed up. Bummer. The good fellas at Carbon Computing (my nearest certified Apple service centre) made me aware of the FireWire mode: you press T during boot and Mac makes the hard disk available as external FireWire device, which can be attached to another Mac and read from it as from any external disk. This feature is supported by firmware and does not need any system installed. I tried it and it indeed worked, but the damage to the file system must have been fairly large, because I could not navigate deeper into the home directory. After I accepted that one and half day of work is lost, the reinstallation of the OS-X from scratch was very smooth and very fast experience – it took about 35 minutes. After booting up, system offered restore from TimeMachine and after another two hours, almost 180 GB of stuff was back on Macbooks harddrive. My Mac was almost exactly like on last Sunday morning .. The “almost” means that Time Machine does not quite restore every bit and piece because after system update check, Mac downloaded about 1 GB worth of patches from Apple side and required restart after install. The size of the patch indicates that it were most likely roll-ups of the updates from 10.5.0 t 10.5.3 – certainly more that could be missing in last few days – which would mean that TimeMachine does not really backup system files. I also had to re-enable root access and modify my /etc/hosts file to enter symbolic names for the VM’s. I am now back up and running and without any lost files other than those who were lost because of my laziness to plug in the disk. I think I start to see selling point for Time Capsule :-). Time machine is still working and I was listening to loud fans for quite couple of hours while Spotlight indexed all restored content again. I still do not know what caused the crash: I was doing lots of video re-encoding, so maybe overheating together with very little free space (I was twice close to 99.5% full disk). And maybe there is really something wrong with the disk. Well – combination of OS-X and Apple hardware is pretty solid combination, but certainly not as rock-solid as Apple marketing would like to make the world believe. I have just experienced a real-life proof that it can crash pretty badly. But I still believe that it is by far the best available option currently available. For variety of reasons. First of all, the most troubles I had, was caused by me not having good enough backup system. Every system is only as good as the weakest link, which is in most cases the human part of the workflow. If I would have used Time Capsule or at least plugged the disk every day, there would be no loss of data, just about 3-4 hours wait until being operable again. Which is much less than I have spent any time while rebuilding Windows machine. With Windows it took me 2-3 hours to install XP – with all three hundred twenty seven updates, thirteen reboots and lots of surfing to find latest drivers for all devices from vendor’s sites. And then usually at least one full day to reinstall development environments, java, Visual studio, Office, tools etc from scratch. Secondly, I never had really good backups while working on Windows – mostly because doing backups was never as easy as connecting a hard disk. As result, I had much larger gaps between backups as nowadays. And considering how much work it was to selectively restore the data … To sum it up: if this would happen on Windows machine, I would probably loose week or more of data not 1.5 days and to be back operational would take at least 1-2 days, not few hours. And third – while the OS-X was being installed, I was working on my old, beaten Fujitsu LifeBook – and I realized I how much I actually I miss the tools and overall user experience of the Macbook Pro. DMCA for Canada ? Act now ! I have got a letter from Online Rights Canada. I believe that what is about to hapen, may have pretty deep implications down the stream. Minimum thing I can do is try to help spreading the word. We understand that the government will imminently introduce legislation to amend the Copyright Act – and it intends to push it through quickly. We at Online Rights Canada wanted to let you know what was ahead in the next few weeks, and what you can do to protect Canada from a new DMCA. When we do get a copyright bill, we need a period to study the bill, and we need thorough Committee hearings that offer a wide range of stakeholders the opportunity to present their views to the Canadian government. We need to challenge Parliament to give provide oversight. If the current government tries to rush this bill through the Summer, we need to stop it in its tracks. All the signs suggest that the bill will be a Canadian version of the American DMCA with a veneer of consumer concessions. The bill will likely include laws modeled on the DMCA instead of the approach adopted by earlier Canadian proposals. Concessions may include a time-shifting right and a format-shifting right, legalizing consumer use of the VCR and iPod after all these years. However, by protecting DRM at the same time, the government kills those consumer rights anywhere the content is locked down! What can you do? Advocacy! Contact your MP – use the advocacy tools at http://www.CopyrightforCanadians.ca and the Facebook group, Fair Copyright for Canadians http://www.faircopyrightforcanada.ca/ to make sure Ottawa knows your views. And get others to do so, as well – we’ll need a summer full of copyright activism to make sure that Ottawa knows that Canada’s copyright laws have to put Canadians’ interests first! To start, take two minutes to send our first letter to MPs about the impending bill. and start spreading the word to your Member of Parliament! I had this discussion with a friend where we both found out that there is surprising amount of very useful little apps and tools in Mac’s software world that people use on daily basis and which are worth of spreading word about. Here is first of the programs I did not know about few months ago – and today I barely can imagine working without them. It supports all usual formats – MOV, MP4, MPEG as well as AVI and what I find very useful is suport for PSP. The VisualHUB is the easiest and most reliable way I have tried so far to transfer the DVD movie to the PSP – for the kids to watch in the car. What we use it for to transform the source files for screencast generated by CamStudio on Windows (AVI) into the format that can be loaded into the iMovie (which happens to be MP4 with H264) so that clarity of screen is retained. We also use it to produce AVI version of the screencast playable on Windows Media Players – for the Windows users stubborn enough to resist installation of Quicktime or free players such as VLC. Before this, I have tried few other options, none of which really worked. VisualHUB does pretty good job at compression – the 420 MB MOV file got compressed into under 100 MB file AVI (with very acceptable loss of quality). The result of exporting the same MOV file into AVI with Quicktime Pro produced over 600 MB that was visually worse than the VisualHUB AVI output. I am not an expert in video formats and video conversions (therefore it is quite possible that I could have done it better with some more digging with QT Pro) – and I do not plan to become one. Which is why the VisualHub is such a great tool for my needs. Highly recommended – and thanks to Gabo who introduced me to this little gem. Disclaimer: I am not affiliated or anyhow interested in sales or marketing of this product. The only reason I am recommending it is because I like it and find it useful. You are currently browsing the Miro's World blog archives for June, 2008.